It is almost upon us! What exactly is it? It is the Easter Vigil Mass, when we as a parish community and as members of the One, Holy, Catholic and Apostolic faith, welcome those desiring to join the Church after successfully completing their formation and preparation begun last September. This is quite an accomplishment, and these lucky few certainly merit our support and appreciation! Please join us at 8:00 PM on Saturday, April 20, 2019 and be buoyed by the love and commitment you will witness in these new Catholics. And did I mention we serve cake afterward? The esteemed Saint Augustine inspires all of us in Our Lady of Grace’s RCIA process this year, which is well underway with approximately 15-20 people formally inquiring about our Catholic faith. 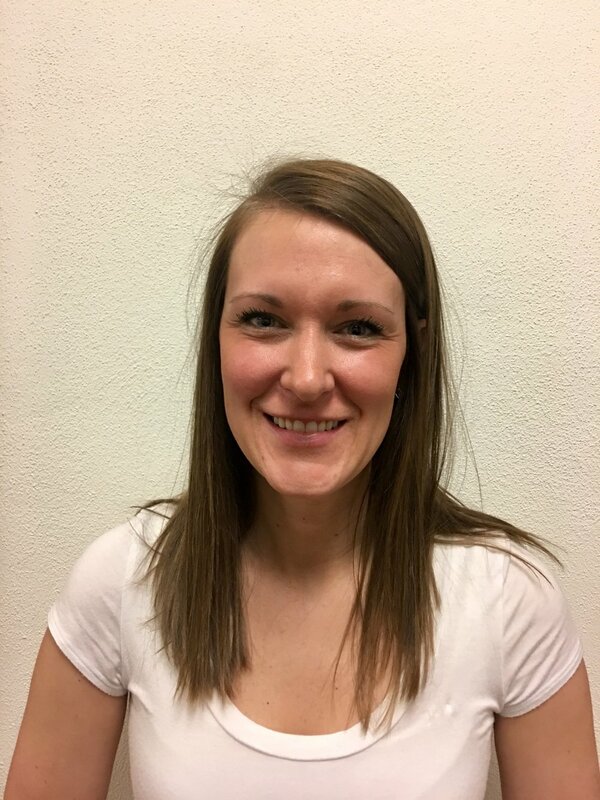 We appreciate those of you who have volunteered to assist in this amazing ministry and, for those of you otherwise occupied, we know we can count on your prayers and support throughout the process, as our seeking brothers and sisters continue to develop their relationships with Jesus Christ and the Church. We will continue to update the parish as we all work together to share God’s love with these folks and welcome them to our parish. Many who have come to “kick the tires” on our Catholic faith were drawn in by how welcomed and cared for they felt by the people of Our Lady of Grace. Keep up the Lord’s work—continue to be Christ to all you encounter, be His hands and feet on this earth. Are you engaged or married to a Catholic and want to know more about the Catholic faith? Are you a baptized Catholic, but missed the Sacraments of Eucharist and Confirmation? Contact Sean Lavell at seanlavell@olgparish.org or in the Parish Office (x9042) for more information. Enjoy some coﬀee and donuts after Mass as you learn how to become more involved, about our faith, and how to serve others by making Jesus Christ known and loved through our Mission and Discipleship ministries. Plan now to visit the booths and talk with representatives from various ministries about becoming Team Catechists and Discipleship Group leaders for Faith Formation, RCIA, Encounter, Conﬁrmation and Life Nights; becoming a Peer Minister or Marriage Mentor couple; as well as joining a Stewardship subcommittee! who accomplishes all of them in everyone. 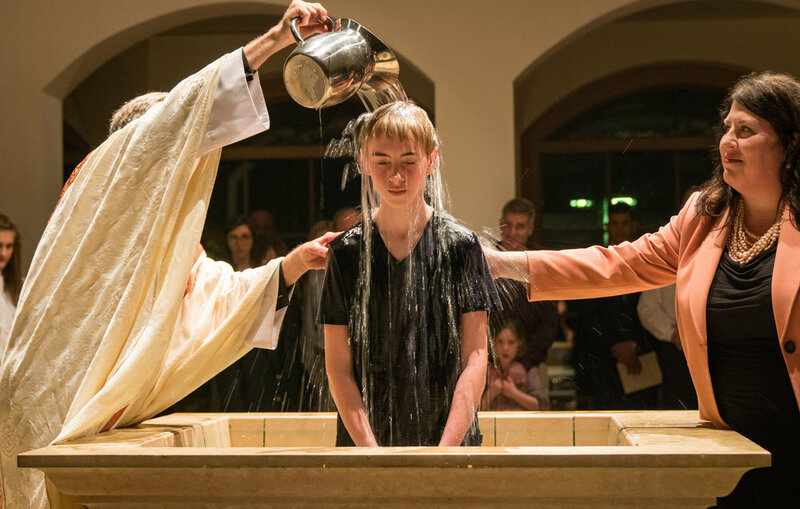 The Sacrament of Baptism calls Catholics to a lifelong vocation of discipleship - to imitate the love of Jesus and share that love with others. By opening our hearts to receive God’s gift of love, we begin to love in a way that transcends our human nature. This conversion call to love is not just a feeling of love but a decision to love, to receive God’s love and return love to Him and His Church. Our Lady of Grace is blessed to have many dedicated and faithful men, women and children who generously share the gifts entrusted to them by the Holy Spirit to serve the people of God. When people with particular qualities and gifts are matched in ministry roles that call for those gifts, they grow in holiness, give new life to the Church and help build the Kingdom of God. This weekend we’re featuring opportunities to serve from our Mission and Discipleship Ministries. As a disciple, how are you being called to steward your gifts and make Jesus Christ known and loved and, in the process, bring others into discipleship? Q: What is Faith Formation? When does it meet? Faith Formation is sharing Catholic Teaching in a small-group format. Each small-group is led by a team of catechists and comprised of children who are a similar age or skill level. Faith Formation meets during the school year on Sundays during 9:30 AM Mass for children ages 3 - Kindergarten and Wednesdays from 6:00 – 7:15 PM for children in Grades 1-5. Q: Who is a catechist? A catechist is anyone who seeks to answer the call of his or her Baptism by using the catechism to teach others how to live our Catholic faith more fully. Q: What is the Catechism? It is the organized presentation of the essential teachings of the Catholic Church regarding both faith and morals. Q: What does participating as a catechist at Our Lady of Grace look like? Training to learn how use our pre-selected and scripted curriculum, which is faithful to the Catechism of the Catholic Church; being willing to grow in your own personal relationship with Jesus and his Church; committing to teach 20-24 sessions. Q: How can I become a catechist? Q: Who is a Discipleship Group Leader? A Discipleship Group Leader is a parent, young adult, college or high school student who guides a small group in discussions, family sharing, fun events, retreats, and more, to help our youth discover the wonderful fruits of living a life founded on Christ. Materials and training provided. Encounter is designed to bring middle schoolers into a closer relationship with Jesus, the one who can ﬁll their hearts with joy, hope and love. Using Discipleship Group Leaders and small groups, our goal is to help participants engage in their faith and build the foundation for a strong Christian life. Each year our youth share and learn about diﬀerent topics that will become important tools for growing in their faith. Prayer, the Sacraments, Theology of the Body and other topics will all be important parts in this process. During 8th Grade our youth will receive the Sacrament of Conﬁrmation. Q: When are Discipleship Group sessions for Our Lady of Grace School 8th Grade students? LifeNights are a mixture of faith and fun for high schoolers - an incredible opportunity to connect with friends and God in the midst of their busy lives. Teens talk about a variety of issues and experiences with friends and a young adult Discipleship Group Leader so that together they grow in faith and discover how a relationship with God will help them have the best life possible. Each LifeNight has a fun game, a testimony or teaching about a diﬀerent topic of our faith, discussion and closing prayer. Q: How can I become a Discipleship Group Leader or learn more about these programs? including daily religion class, weekly celebration of the Eucharist, First Reconciliation, First Holy Communion and Conﬁrmation. when learning the communal prayers of our faith, praying for each other and sharing with ‘prayer buddies’. during monthly service projects, all school family service events, Middle School Service club, altar serving, Peer Ministry, Sharing and Caring Hands and multitude of parent volunteer roles in the classroom and beyond. when we practice living and learning a speciﬁc virtue each year. RCIA is the process by which people become Catholic. Our RCIA process is a great blend of fellowship, formation, prayer and laughter. We have a dedicated team who loves walking with others on their journey with Jesus and his Church. Stewardship committees help build a culture of lived discipleship through prayer, hospitality, service and formation. Help restock and organize prayer cards and pencils in the pews after each Mass. Time commitment: 20 minutes after Mass. Occurs on 3 consecutive weekends in September and one weekend in March. Help oversee and serve donuts and coﬀee after Mass on pre-selected weekends and/or during Prayer Fair Weekend and Ministry Fair Weekends. Lead a 20-minute workshop after Mass on a prayer-related topic of your choice. Prayer Fair usually occurs on the second weekend of Lent (March 16-17, 2019). Help welcome new parishioners through participation in our registration weekends and phone call outreach. NEW! Welcome Dinner Team – we are looking for individuals interested in starting and managing a bi-annual Welcome Dinner with our priests. We are in need of individuals who have an audio/visual production and editing background and are willing to give their time and expertise in creating and producing a New Parishioner Welcome Video. Our Lady of Grace has been blessed to provide support to couples on their wedding day for more than 20 years through the Wedding Ministry Team. 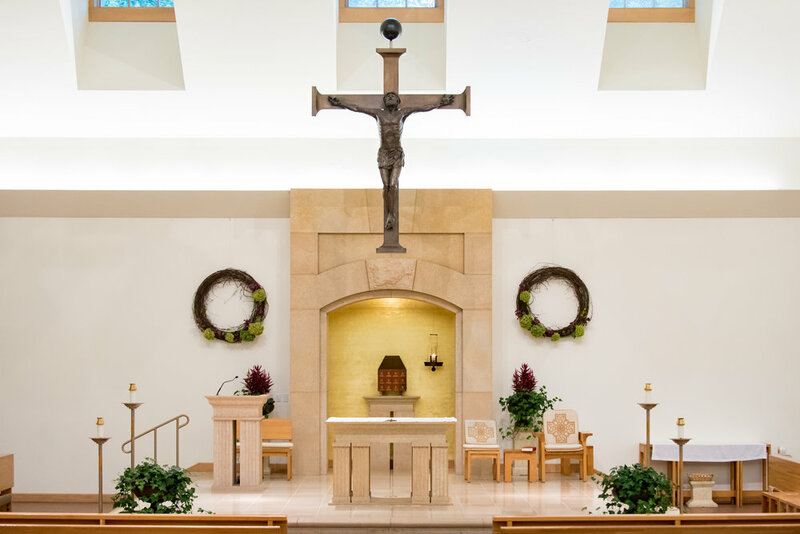 Members of the Wedding Ministry Team assist the lead coordinator at rehearsal, help prepare the Church, coordinate the procession and communicate with ﬂorists, musicians, guest celebrants, photographers, videographers and outside wedding planners on the day of the wedding. Time commitment: Approximately three hours on a Friday or Saturday, once every four or ﬁve weeks. On behalf of the Pastor, Mentor Couples help prepare engaged couples for a long and fruitful marriage. OLG’s highly developed Prepare Ministry plays a crucial role in helping couples have successful and happy marriages. Time commitment: Seven hours of expert training upfront. Meet with two or three couples each year for a total of 18-27 hours annually. Occasional meetings with Prepare Ministry Leadership. An evening dedicated to spending a celebratory and enriching time with your spouse. Planning needs include catering and dessert coordination, decoration planning, program development, budget management and day-of setup/cleanup. I’ve often thought this should be the oﬃcial prayer for our RCIA group here at Our Lady of Grace – perhaps for all those in RCIA formation everywhere. I think St. Thomas succinctly captures the desires of all who embark on this somewhat arduous journey into the Catholic Church. What used to take three years of formal preparation has been condensed quite a bit to 9-10 months. However, the content is still, of necessity and authenticity, a lot. Thankfully that shorter duration has been assisted greatly by excellent resources. It is still a lot of prayerful, studious eﬀort on the part of the inquirer, but this format instills in them, hopefully, the importance of continuous growth in the future. A running theme throughout our RCIA sessions has always been an introduction to the saints. We have weekly assigned readings often covering one or two of the “biggies”, referencing certain saints as their feast days come up in the calendar. The idea we try to convey is that the Communion of Saints is very real and impactful in the everyday lives of everyday people such as ourselves. The saints amaze us and inspire us. And while none of us may reach that upper echelon of saints with a capitol “S”, that doesn’t mean we aren’t called to strive for holiness in our very everyday-ness. That eﬀort alone, to become a saint, by each/all of us, should go a long way toward building up the Kingdom of God here and now. Please pray for our RCIA group as they start thinking of whom among the saints they will choose for their own Conﬁrmation names at Easter Vigil. Do you remember why you chose your Conﬁrmation name? What has your spiritual relationship been with that Saint these many years? Be sure (and inspired!) to check out the collection of books on the saints we have in the Parish Library across from the MHT Adoration Chapel. We are back in full force as we prepare for the Rite of Sending/Rite of Election on February 18. This will be another stepping stone for the group en route to full communion into the Catholic Church this Easter Vigil. Thus far after break we have grappled with the pure gift of Grace, sought solace in understanding the Seven Sacraments, and are now delving deeply into the constructs of the Ten Commandments. The participants are hungry to learn all they can about the fullness of our Catholic faith, and are a weekly inspi-ration to all of us on the RCIA team. Please do your part as practicing Catholics and pray for their blessed journeys into our faith and our community at Our Lady of Grace. Every time they see each of you participating fully at Mass—genuﬂecting into the pew, actively participating, receiving the Eucharist reverently and, yes, even remaining in your pew—singing until the recessional is complete, you are helping to build His kingdom. Copious thanks for your support in this awesome endeavor! Please continue to pray for our “new” Catholics, initiated fully into the Church this past Easter Vigil through the Rite of Christian Initation for Adults (RCIA). Please continue (or start) to support these folks in their special “neophyte year” as part of our own calling as faith-filled Catholics, as part of our loving parish community and as the world-wide One, Holy, Catholic and Apostolic Church. We want to invite any and all who are visiting Our Lady of Grace and have interest in learning more about Jesus and his Church to contact either Sean Lavell at seanlavell@olgparish.org, or Margaret Lively at 612-840-8240 for more information about RCIA here at OLG. 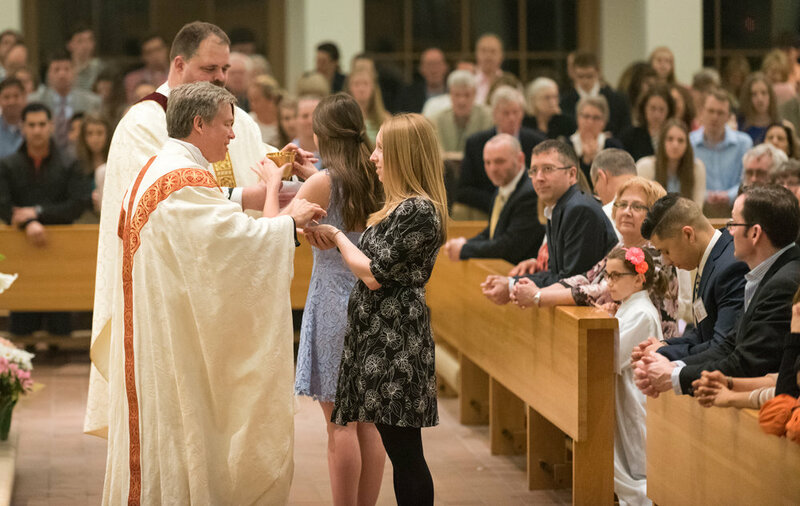 While the RCIA process is always open and on-going, the formal part of the process does start each fall and runs through Easter Vigil, continuing on until Pentecost. For those considering the Catholic faith for the first time, or those not fully-initiated sacramentally into the Church through Confirmation, we are here to answer questions and help you explore the beauty of the Catholic faith. Do your part to help build God’s kingdom—get involved with RCIA! There are so many beautiful ministries and ways to live your Catholic faith at OLG—what a true gift this parish is. One way you can make a personal difference in the life of another is to become a Parish Mentor for a candidate in our RCIA process. While the commitment to you may not seem that significant, your impact on another soul can be truly life-changing. Contact either Sean Lavell at seanlavell@olgparish.org or Margaret Lively at 612-840-8240 for more information.